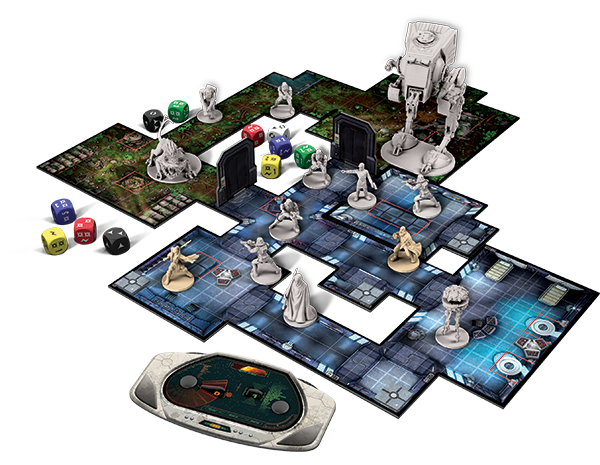 Imperial Assault casts you and your friends into the climactic events following the Death Star’s destruction above Yavin 4, and offers two full game experiences within the Star Wars universe. In the campaign game, you and up to four other friends play a series of thrilling missions woven together in a narrative campaign, and in the skirmish game, you and your opponent muster your own strike teams and battle head-to-head over conflicting objectives. Set in a mythical land of the same name, Hyperborea is a light civilization game for 2 to 6 players that takes 20-25 minutes per player. The game begins at the time when the magic barrier protecting access to the mythical continent of Hyperborea suddenly falls. The game’s main mechanism, which can be described as “bag-building”, involves you building a pool of “civilicubes”. Each cube represents specializations for your kingdom: war, trade, movement, building, knowledge, growth. Grey cubes represent corruption and waste, and players will acquire them by developing new technologies. (Power corrupts by its own definition, and the more complex a society becomes, the more waste it generates.) Each turn, players draw three random cubes from their bags, then use them to activate knowledge (technologies) they own. • Fighters are flown by a single person and are fast and maneuverable, but lack shields and can be easily destroyed. In “Carrier Strike”, suitable for 6-10 players, each team gets one original ship (now called a Capital Ship) and one fighter. “Fighter Assault” has two fighters trying to take out a single heavily armed capital ship and is designed for 4-6 players. Finally, “Fighter Duel” brings the Dice Duel experience to two players, as two fighters go head-to-head for a quick and intense battle. • Experimental Equipment cards upgrade the capital ships with a variety of unique and powerful abilities. Through a draft mechanism, each side selects two upgrades and needs to tailor their strategy to take advantage of their strengths. The 27 cards include new weapons, enhancements to existing systems, new movement options, and more. The core mechanism of Imperial Settlers is based on concepts from the author’s card game 51st State. Mice and Mystics: Downwood Tales is a box chock full of adventure and whimsy. New storybook, a pile of new miniatures, new heroes, new villains, new location tiles, new search deck items. Downwood Tales takes the adventure outdoors. Meet frogs, turtles, rabbits, the wise sages – the three blind mice, ride leaves like parachutes out of the trees and much, much, much more. Downwood Tales gives you multiple playable characters, new villains, new minions, tiles, a ton of new mechanics, equipment, new story arcs and more! New to this big box expansion is the gecko named Jakobe and he’s not your run-of-the-mill gecko, he’s a smooth operator, a ranger of the forest, a lizard for hire who is leading our heroes through some of the greatest dangers they will ever face! With more fun elements than you can shake your tail at, Downwood Tales is the next exciting installment in the Mice & Mystics world! The Dungeons & Dragons: Attack Wing – Starter Set includes three pre-painted dragons, maneuver dials, and upgrade cards and tokens. Robotech RPG Tactics is a tactical miniatures game set in the Robotech universe. While the 1/285th scale game pieces can be used as a companion to the Robotech RPG, the game system is designed to be played as a tabletop miniatures game. Players build armies of multiple squadrons of mecha to fight it out in scenario-driven, objective-based game play. Take command of the fighting forces of the United Earth Defense Force (UEDF) valiantly defending Earth from alien annihilation – or lead the massive clone armies of the Zentraedi Armada to recover an alien artifact of immense power and enslave humankind. Depending on the faction, and their choice of mecha, a player’s army may include anywhere from two game pieces to as many as you desire! The rules are scalable from small skirmishes to mass combat with hundreds per side. Robotech RPG Tactics uses a dynamic turn system. Players trade off activating squadrons during each turn, ensuring that a player never has to sit and wait while his opponent moves and attacks with his entire army. By using alternating activation of squadrons, the game’s action unfolds at a fast and furious pace, allowing large scale battles to be easily carried out in a single evening. Each player receives a number of Command Points each turn based on the number of mecha they have on the field, and the quality of their officers. Command Points are spent throughout the turn on maneuvers such as boosted movement, devastating weapon salvos, breakneck dodging counterattacks, and potent special abilities. The wide variety of mecha in the boxed game bring to bear the myriad and awesome weapon systems from the Robotech universe to lay waste to your foes. Even the battlefield itself can alter over the course of the game as buildings are leveled by destruction unleashed during the battle. End: If there is at least one card left in the deck, the turn goes to the next player; if not, the investigation phase starts. Using the investigation speed indicated on the card each player has in hand, players take turns guessing which player (whether yourself or someone else) holds the “Lost Legacy” card; this card might also be in the “Ruins”, a location that holds one card at the start of the game and possibly acquires more cards during play. The player who guesses correctly wins; if no one finds the Lost Legacy, then everybody loses. This is the English release of the 16 cards The Starship set in Lost Legacy. The Flying Garden set is released separately.